Naiads are slender, narrow-leaved plants that grow completely under water and are rooted to the bottom. The leaves are slender, have finely toothed edges, and occur in pairs or whorls, with each leaf base swollen to form a sheath around the stem. There are tiny greenish flowers at the leaf bases. 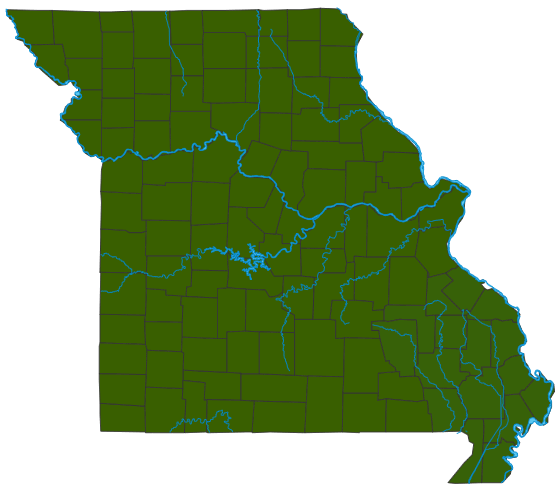 Four species of naiads have been recorded in Missouri. The most common is southern naiad (N. guadalupensis), a native species that forms large mats and is sometimes encrusted with lime. Brittle naiad (N. minor), an introduced species, is expanding its range and is expected to become more widespread. Its leaves curve backward during the growing season and have teeth along the edge that are visible without magnification. Similar species: Several other plants, including some of the narrow-leaved pondweeds. Naiads, however, never have broad, floating leaves or conspicuous flowers or seed heads. Submerged aquatics in lakes, ponds, and other calm or slow-moving waters. Some naiads, especially southern naiad, can grow so rapidly they become nuisances. Brittle naiad, native to Europe, was found in the eastern United States in the 1930s. It is spreading quickly, apparently via migrating waterfowl. It was first recorded in Missouri in 1990 and will likely become more widespread. Meanwhile, northern naiad (N. flexilis) is sensitive to pollution and water quality changes and is declining. Naiads and other humble aquatic plants are important parts of the aquatic ecosystem. They help to give us good water quality, fine fishing and boating, attractive landscapes, and all the industry and economic perks that come with such treasures. Naiads are an important food for waterfowl, which eat the seeds. As with other submerged aquatics, naiads provide shelter for young fish and other aquatic organisms.